The Mini E is BMW's first foray into electric vehicles. The two-seat, battery-powered variant of the Mini Cooper was leased to 450 people in California and New York City. Some owners have opted to extend their leases until the arrival of the BMW 1-series-based ActiveE next summer. The hot product topic in 2010? That's easy -- electrification. The conversation was dominated by hybrids, plug-in hybrids and electric vehicles. 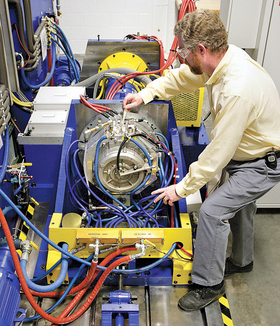 Paul Turnbull, General Motors' electric motor development manager, monitors an electric drive test at GM's Powertrain Engineering Development Center near Detroit. GM announced in January that it would be the first major U.S. automaker to design and manufacture electric motors. 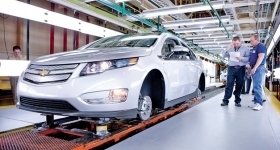 The first pre-production Chevrolet Volt moves down the assembly line at a General Motors plant in Hamtramck, Mich., in March. At the Volt's official launch ceremony in November, CEO Dan Akerson said GM is studying how it could double or triple production should demand accelerate. About 240,000 potential buyers have expressed an interest in the vehicle, but production in 2011 will be just 10,000 units. The Obama administration's policy has pushed battery-powered EVs over the hydrogen fuel cell alternative, but some industry advocates continue to push fuel cells -- and hydrogen pumps, like the one in use below. They say that hydrogen is faster to refuel and eliminates the range problems of batteries. 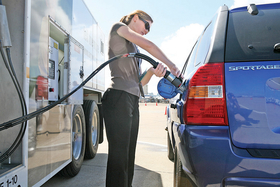 Critics counter that the cost of hydrogen and a pumping network would be excessive. 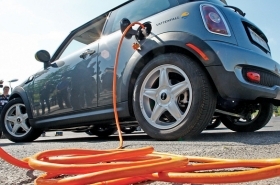 The first stirrings of an EV-charging infrastructure began this year. 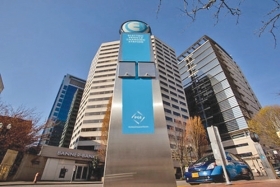 This Portland, Ore., office building has a charging station nearby. And in the state of Washington, officials hope to alleviate range anxiety -- the fear that an EV will run out of juice with no charging station nearby -- by installing a series of stations on I-5, the state's major north-south freeway. 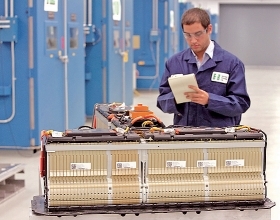 A battery engineer checks a Chevrolet Volt battery at the General Motors Global Battery Systems Lab in Warren, Mich., in June. The Volt will offer customers an unprecedented standard 8 year/100,000-mile warranty on its lithium ion battery. Each Volt battery pack has nine modules and 288 cells.